Gov. 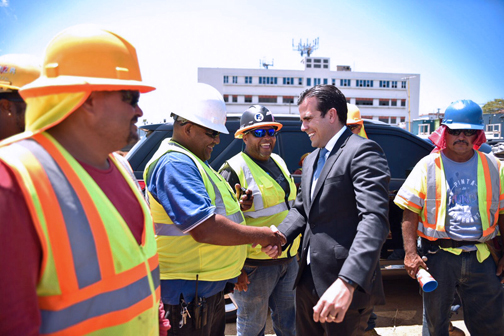 Rosselló signed the Permits Reform, which is expected to promote investments and create jobs. Gov. Ricardo Rosselló signed Tuesday the Permitting Reform Act (Law 19-2017), that seeks to streamline the permitting process for businesses and promote new investments, job creation, and economic development on the island. “A few weeks ago we introduced this bill, which now becomes law, to continue promoting economic development and reduce government red tape. It is part of our efforts, and our promise, to turn Puerto Rico into an attractive destination for investment,” Rosselló said during the signing ceremony. The new law consolidates the process to obtain a permit, certification of fire prevention, environmental health, licenses, and authorizations into a Single Permit, in order to expedite the process. “This piece of legislation is a necessary structural reform that increases our competitiveness and puts us in a better position to attract foreign investment, which we so need to reinvigorate our economy and generate job opportunities in Puerto Rico,” said Ricardo Álvarez-Díaz, president of the Builders Association of Puerto Rico. Small and mid-sized businesses will be able to obtain the Single Permit automatically. The law also creates the Unified Information System, which integrates all requirements to do business in Puerto Rico into a single website (One Stop-PR Doing Business). This website allows users to apply for both state and municipal permits and licenses online, through one single website. “The approval of the permits law is a positive step that reflects, in spirit, flexibility and simplifies the burdensome permitting process that has negatively impacted the competitiveness and will help create a more favorable investment environment needed to revive the island’s economy,” said CPA David Rodríguez, spokesman for the Private Sector Coalition and president of the Puerto Rico Chamber of Commerce. In Puerto Rico, obtaining a construction permit used to take on average 165 days and involved 20 separate processes. According to the World Bank’s Doing Business Report, Puerto Rico is currently listed 131 out of 190 countries in the ease of obtaining a building permit. The statute creates an Ad Hoc Committee to designate those strategic projects for which there is a compelling interest and centralizes the evaluation of these projects in the Permits Management Office. A single permit in 3 weeks requires action by a small group that knows impact on all providers of permit related services- like connections to power, water, sewer, roads, fire,police, schools, that come from local, regional, and state efforts. Concerns like zoning, environment, and a thousand other restrictions and concerns of special interest groups are also involved. When the system to do all this is working, many of us will consider using it. Until then, we must find other solutions. Hey Buddy!, I found this information for you: "Roselló signs Permitting Reform Act, simplifies process". Here is the website link: https://newsismybusiness.com/rosello-permitting-simplifies/. Thank you.